The all-suite ship will cruise the Chilean coast, with visits to Puerto Montt for the Chilean Lakes district, Castro on the island of Chiloe, and Puerto Chacabuco, where guests can access Torres del Paine National Park. She will then cruise the Chilean Fjords before transiting the Beagle Channel and its Glacier Alley. Following a call at Ushuaia in Argentina’s Tierra del Fuego, the Quest will cruise by Cape Horn bound for the southern ocean. Guests will experience five days in Antarctica, including scenic cruising of highlights such as the Lemaire Channel, picturesque Paradise Bay and the Gerlache Strait. An experienced Antarctic expedition staff will see that guests enjoy the best of the available sites landing sites and cruising in inflatables, based on local conditions. Scientists, naturalists and other lecturers will speak on board and also accompany guests ashore to add insights to their experiences. In the South Atlantic, guests will enjoy visits to Port Stanley, in the Falkland Islands, and Montevideo, Uruguay, en route to or from Buenos Aires. A 24-day version will include two days exploring the sub-Antarctic wildlife island of South Georgia, renowned for its beauty and vast, teeming rookeries of king penguins and seabirds, as well as breeding elephant and fur seals. 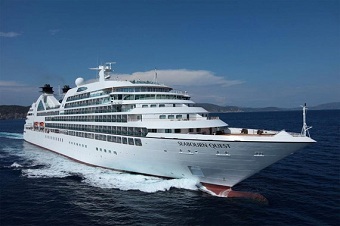 Although parent company Holland America Line has been sending ships to the Antarctic for some time now, the difference is that Seabourn will make actual landings instead of just cruising by. The whole idea of going to Antarctica without making any landings can best be compared to a date without a goodnight kiss!